In the wake of Amoris Laetitia and the still unanswered Dubia, heretical notions have spread abroad to suggest that God somehow does not give us the graces necessary for us to avoid sin in our state in life. This is an essentially Lutheran heresy, which was clearly condemned long ago at the Council of Trent. The tendency towards this error has sadly found even more exposure recently via the sacrilegious writings and interviews released by that other scandalous Francis-favourite, Cardinal Francesco Coccopalmerio. In order to counter these grave errors and provide readers with some edifying spiritual reading for this great feast of St. Joseph - the greatest of saints after Our Lady - we offer the following reflection from the writings of Dom Bernard Marechaux. He was a French Benedictine abbot and spiritual writer, who lived from 1849-1927. Mary belongs to God; She is the golden ladder by which God wishes to come down to men and to draw them to Himself. But consider this extraordinary fact: although the Virgin is the beloved one God took for Himself and the wedding chamber in whom the Son chose to unite Himself to His humanity, the Lord saw fit that She should become the spouse of a man, that man being St. Joseph. Was it in God's plan to give a mortal man some kind of lawful rights over this blessed creature, this holy Virgin? It was indeed - and we are dumbfounded by this act of divine will. 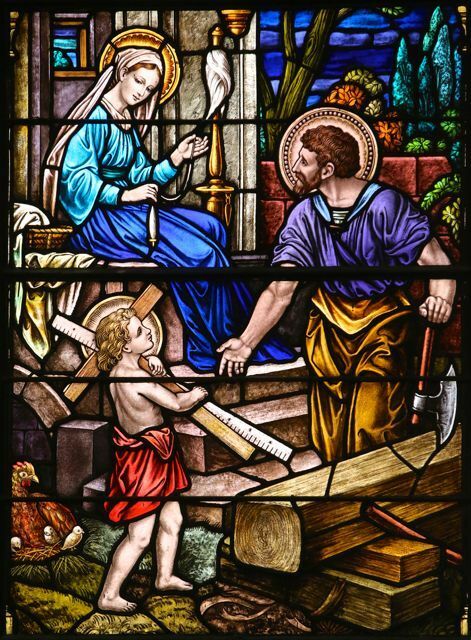 Who, then, is this St. Joseph, this one chosen by Heaven, this most favoured among all men, the one to whom God was pleased to entrust the woman He created with such great love and jealously made His very own? St. Joseph is a son of David, a close relative of the Virgin. Mary, full of grace though She was, had to live on earth and needed an earthly support, a human arm of flesh and blood to shield and uphold Her. St. Joseph will protect and defend Her as his own, for She will be his true spouse. Such was this son of David's purity of heart that Mary, while She was totally his, could still belong totally to God. They were united in a true marriage, so that each might be closer to God, with, one might say, the help of the other. Concupiscence was extinguished in St. Joseph, and his soul shone with brilliant purity when he came into the presence of the Blessed Virgin. It could not be that She should be loved by someone who was not perfectly chaste. We see in St. Joseph a totally purified soul, a soul in which sin has lost its power. St. Augustine, while asserting that no one is ever free from sin in this life and that even the saints must pray ''Forgive us our sins,'' recognized that God could, if He so desired, by way of exception and special privilege, ''completely take away the corruption which causes a man to sin and array him with incorruptibility in this life so that he might see God everywhere present, just as the saints in Heaven see Him but without a veil (De Spiritu et Litt). Surely this marvellous privilege was granted to St. Joseph who was called to virginity in marriage and who had the Son of God always before his eyes. Was he not, as St. Augustine says, completely taken up with unceasing contemplation of his God? How could he sin? In the holy house of Nazareth, there was no place for sin. O St. Joseph, we catch a glimpse of your holiness in its dazzling mystery - Mary can be yours, but no less God's for all that. Furthermore, being yours, She belongs to God even more than before, and it is when she became yours that the great mystery for which She was created was accomplished in Her. How admirable God's arrangement! How it brought to light St. Joseph's extraordinary purity of soul, he who did not keep the love of the creature for himself, but returned everything to God! What a lesson you teach us, O great Saint! You wanted nothing which is not of God and for God. In Mary, you experienced only God, as Mary experienced only God in you. Obtain for us, great Saint, the grace to be able to imitate such purity of heart. We pray that, through the intercession of St. Joseph, Our Lord Jesus Christ will grant our readers many graces and blessings on this special day of the year; especially the grace of finding and loving God in all things. St. Joseph, Patron of the Universal Church - Pray for us!